with Network Rail at Porthmadog, shortly after its installation in November 2006. The crossing forms part of the Welsh Highland Railway extension from Rhyd-Ddu to Porthmadog. Aberystwyth. Cliff railway with a rise of 389 feet (118 m) to the top of Constitution Hill. Project to reopen the line between Gaerwen and Amlwch. 17½ miles (28.2 km). Standard gauge. Llanuwchllyn to Bala (Penybont): 4½ miles (7.2 km). Possible future extension to Bala Town, a further ½ mile (0.7 km). 600 mm gauge. Steam hauled. From Plymouth Road, Barry Island, via Barry Island Transport for Wales station to Gladstone Bridge (1½ miles, 2.4km). Extension proposed to Barry Dock (a further ½ mile, 0.8km). Possible future extension from Plymouth Road to Barry Pier, about ¼ miles (0.4km). Standard gauge. Steam and diesel hauled and diesel railcars. Long term project to reopen the line between Blaenau Ffestiniog and Trawsfynydd. 6½ miles (10.5 km). Standard gauge. Pant (near Merthyr Tydfil) to Torpantau: 5 miles (8 km). 600 mm gauge. Steam hauled. Currently operating on two short of standard gauge line: at Llynclys (about ¾ mile, 1.2 km) and at Oswestry station (about ½ mile, 0.8km), the former operated by heritage diesel railcar and the latter usually diesel hauled, with occasional steam events. Long term plans envisage reopening the whole of the line between Gobowen and Pant, about 8¼ miles (13 km). Betws-y-Coed (next to Transport for Wales station). 7¼ in (184 mm) gauge miniature railway, over ½ mile (0.8 km) in length, steam or diesel hauled; and a 15 in (381 mm) gauge miniature electric tram line, also about ½ mile (0.8 km). Corris (near Machynlleth) to Maespoeth, a little over ½ mile (almost 1 km). Extension planned to Coedwig South, a further ½ mile (0.8 km). Possible future extension to Tan-y-Coed, for a total length of 2½ miles (4 km). 2 ft 3 in (686 mm) gauge, usually steam hauled. Project to restore about ¾ mile (1.2km) of line from a point near the Surf Snowdonia attraction on the site of the former aluminium works to Dolgarrog Transport for Wales station. Standard gauge. Fairbourne (New Station / Gorsaf Newydd adjacent to Transport for Wales station) to Penrhyn Point (for ferry to Barmouth): 2½ miles (4 km). 12¼ in gauge. Steam hauled. Harbour station, Porthmadog (interchange with Welsh Highland Railway) via Minffordd (connection possible with Transport for Wales) to Blaenau Ffestiniog (Transport for Wales station): 13½ miles (21.6 km). 600 mm gauge. Steam Hauled. Project to reopen 5 miles (8 km) of line between Pontycymer and Brynmenyn (near Tondu). Chirk: project to reopen about ¾ mile (1 km) of the former tramway, with a planned extension of a further 1 mile (1.5 km) and a possible future extension to Glyn Ceiriog, a total distance of about 6 miles (10 km). The original tramway was built to the unusual gauge of 2 ft 4½ in (724 mm), although the restored tramway may use a different gauge for reasons of availability of suitable equipment. Llandudno. Connects the town to the Great Orme headland, in two sections: Victoria to Halfway, 872 yards (797 m) and Halfway to Summit, 827 yards (756 m). Funicular railway with some street running, unique in the UK. 3 ft 6 in (1067 mm) gauge. Llanberis (across road from Snowdon Mountain Railway station) to Penllyn: 2½ miles (4 km). 600 mm gauge. Steam hauled. 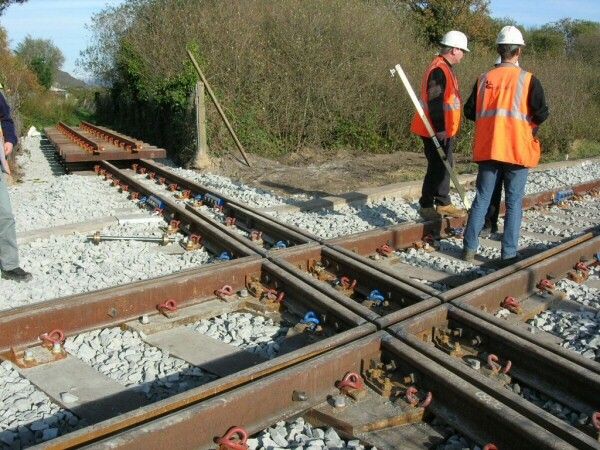 Project, based at Cynheidre, to reopen all or part of the line from Llanelli to Tumble. Standard gauge. There are also plans for a miniature railway at the Cynheidre site. Llangollen to Corwen: 9 miles (14 km). Standard gauge. Steam and diesel hauled and diesel railcars. Dining trains operate at certain times. Margam Country Park (near Port Talbot). Castle to Orangery, a little under 1½ miles (2.3 km). 2 ft (610 mm) gauge. Diesel hauled with steam outline locomotive. Pembrey (near Llanelli). Line over ½ mile (0.9 km) in length. 2 ft (610 mm) gauge. Blaenavon to Whistle Inn via Furnace Sidings, about 1¾ miles (2.8 km), with a branch from Furnace Sidings to Big Pit National Coal Museum, about ½ mile (0.8 km). A few trains run south of Blaenavon to Coed Avon, a further ¼ mile (0.4 km). Steam and diesel hauled and diesel railcars. Located in rural Powys southwest of Welshpool, a private railway occasionally open to the public. 15 in (381 mm) gauge, steam hauled. Rhyl. Line about 1 mile (1.6 km). 15 in (381 mm) gauge. Usually steam hauled. The Miners’ Tramway, 450 yards (411 m) in length, narrow gauge, battery electric hauled. The Deep Mine Railway, a specially constructed funicular railway descending 235 feet (71 m) into the mine at a gradient of 1 in 1.8 (55%). 3 ft (914 mm) gauge. Llanberis (across road from Llanberis Lake Railway station) to Snowdon Summit: 4¾ miles (7.6 km), with a rise of 3140 ft (957 m). 800 mm gauge Abt rack system, the only rack railway in the UK. Steam locomotives propel a single carriage uphill and provide braking when proceeding down. Tywyn, Wharf station (adjacent to Transport for Wales station) to Nant Gwernol: 7¼ miles (11.6 km). 2 ft 3 in (686 mm) gauge. Usually steam hauled. Henllan (near Newcastle Emlyn) to Pontprenshitw: about 1½ miles (2.4 km). 600 mm gauge. Steam or diesel hauled. There is also a 7¼ in (184 mm) gauge miniature railway, about 400 yards (366 m) in length, at Henllan. Aberystwyth to Devil’s Bridge: 11¾ miles (18.9 km). 600 mm gauge. Steam hauled. Castle Square, Caernarfon to Porthmadog (22¾ miles, 36.6 km). Interchange at Pen-y-Mount with the Welsh Highland Heritage Railway and at Porthmadog (Harbour station) with the Ffestiniog Railway. 600 mm gauge. Usually steam hauled. Miniature railway in the Gypsy Wood theme park at Bontnewydd near Caernarfon. A little under ½ mile (0.75 km), 10¼ in (260 mm) gauge. Hauled by battery electric powered simulated steam locomotive.